Obscured by Clouds. The rough and ready blog of a cloud benighted biologist and amateur astronomer. 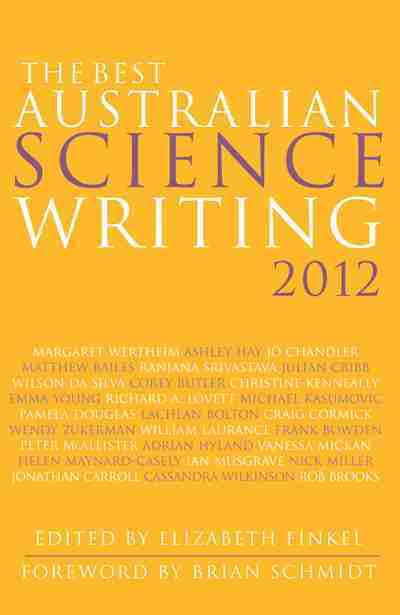 Astroblog will cover my interests in astronomy, biology and Life, the Universe and Everything. Comet 252P as seen from Adelaide at 22:00 ACDST 17 March, similar views will be seen elsewhere in Australia at equivalent local times. Click to embiggen. Comet 252P is still brightening rapidly, with the last reported magnitudes being around 6.5. While this is just below the threshold of visual detection, the comet is diffuse and extended, and will be much harder to see than the magnitude suggests. Last night in suburban Largs, with good visibility despite a waxing Moon, I was unable to see it with 10x50 binoculars, although it has been reported from darker skies with stronger binoculars. 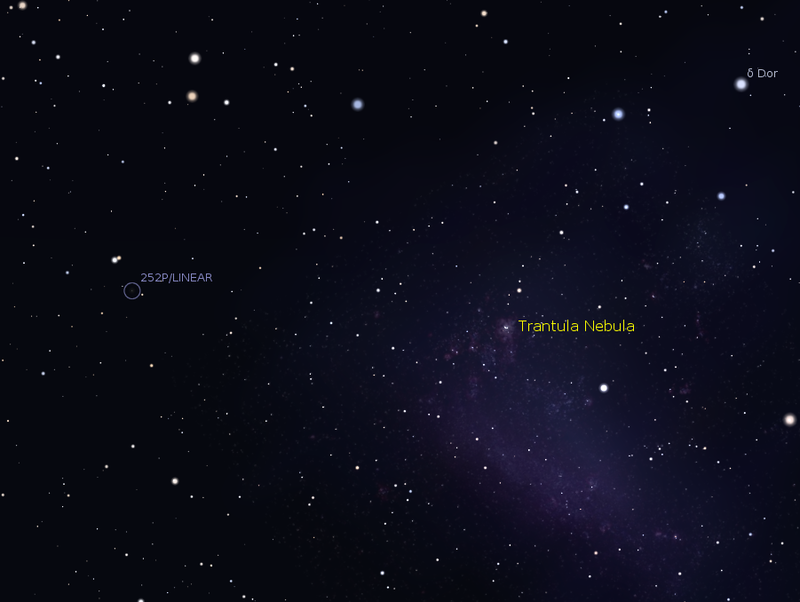 The Tarantula nebula was obvious though in my binoculars. High power view of 252P at 22:00 ACDST 17 March, the comet is east of the Tarantula nebula, which will be s signpost for finding the comet. Click to embiggen. Tonight the comet is on the outer fringe of the Large Magelleanic Cloud. Despite the waxing Moon, if you have dark skies and wait until the Moon is low, then with decent binoculars or a small telescope you should see a fuzzy ball on the edge of the LMC. Looking south, if you draw a line from the long axis of the Southern Cross to the Star Achenar, then draw a line perpendicular to this from Canopus, the comet will be around one binocular field up from the intersection of these two lines. 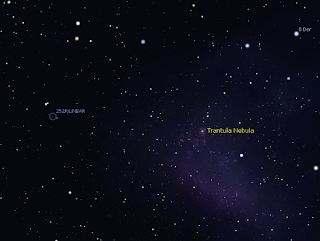 In binoculars or a finder scope, the fuzzy Tarantula nebula will be obvious at this location, the dimmer comet will be one or two fields to the east, near an obvious pair of stars. 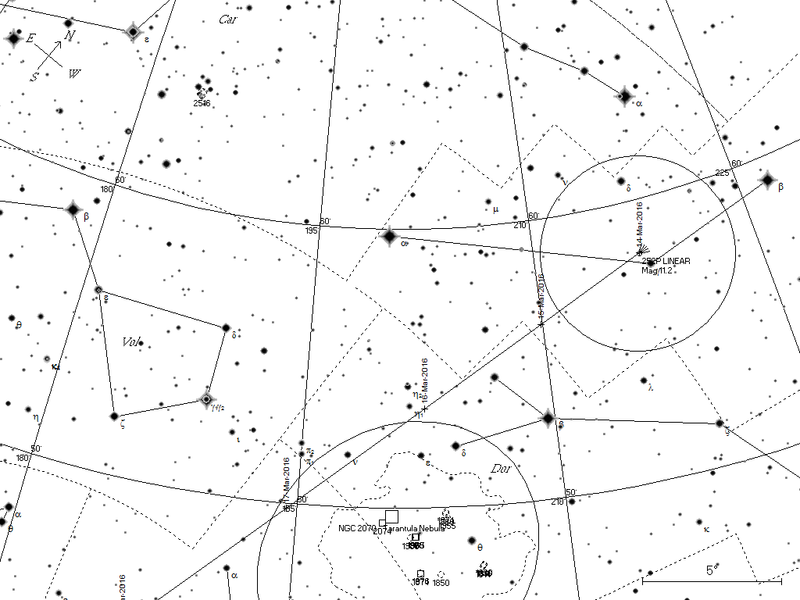 Black and white chart of the path of comet 252P/LINEAR suitable for printing and for use with binoculars and finder scopes (with redlight torches). The circle is the field of view of 10x50 binoculars. Click to embiggen and print. The comet is moving very rapidly leading up to closest approach. The comet will continue to brighten, but the rapidly brightening Moon will make it harder or see. Hope you catch it, reports of it being magnitude 4.8 and visible to the unaided eye, nothing but cloud here. is it possible the i had seen the comet from north America? Due South ? I am up now. 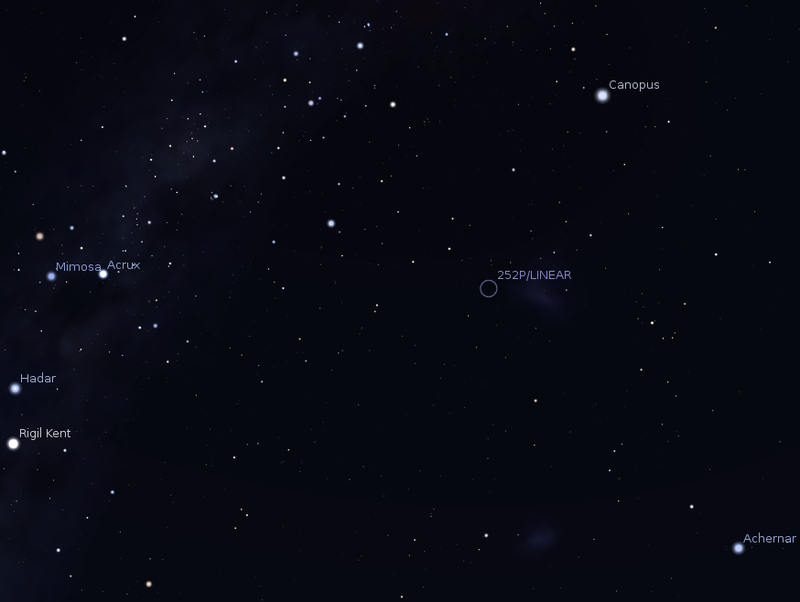 how do you find it on stellarium ? 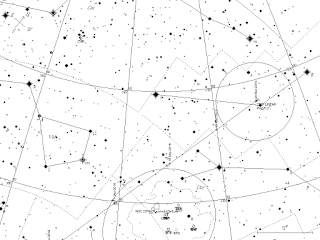 How can i use stellarium to find it ? 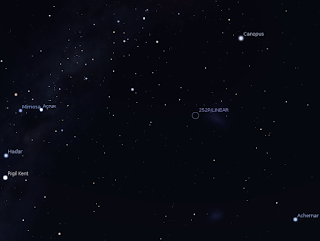 how can i find it on stellarium ? what name are they using ? You have to download the elements in Solar System Editor (F2 > Plugins scroll to solar system editor > click configure > Solar System > import orbital elements > Comets > MPC list of obsrrvalble comets and scroll down to 252P to add the comet. One yoy have added the comet uo acn search for it using F3 turn planet hints on and increase planet visibility with the slider in F4 . Disclaimer Be careful out there, I'm not your mum. A Voyage to Arcturus:R.A. 14:15:39.7, Dec. +19°10'57"
Space Weather - Aurora etc. 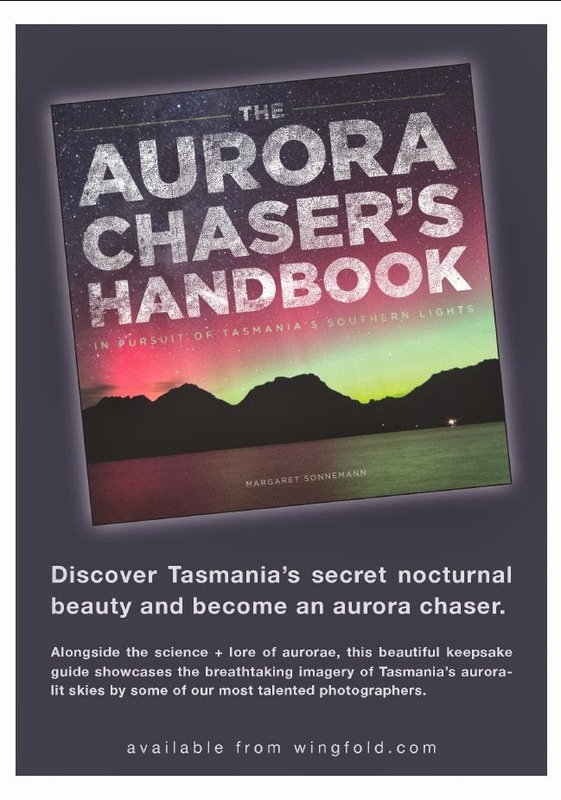 Southern Skywatch March, 2016 edition is now out! Where are visitors to this page?